I honestly did not know what exactly to call this mani, so, I am calling it 'Lighthouse Action' only because it uses CG Lighthouse. I know, I'm clever! PLUS, I feel like I haven't posted up anything in forevvvvver and I owe you all! It was something really easy. I was working as acting manager all weekend and realized at 10:30pm the night before that I needed my nails painted. Genius! That and I was trying to finish a movie that I fell asleep during a few nights before. I had heard many times over (via blogs!) that WnW Black Creme is a good black polish for stamping.. You know, you amazing bloggers never let me down! LOVE! Now for some hauling that I have done recently. I don't believe I have mentioned any of these yet.. And if I have, I do apologize!! I finally decided that I needed OPI Sparrow Me The Drama. When I bought a few other colours from the POTC collection, I picked up that colour for my 'bff' C, but not for myself. HUGE mistake! I went to the Chatters closest to me.. THEY WERE SOLD OUT of just that colour. Ugh. BUT of course the sales lady told me that OPI was buy 2 get a free top coat.. 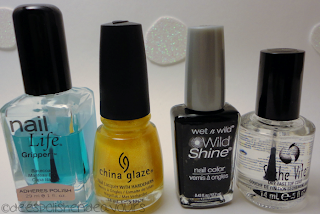 I always try to collect random top and base coats for the ma and sis (I keep shell out the money for the good stuff, so they belong to just moi!).. Anyways. OPI I Lily Love You & Over The Taupe called my name. Love them both! Then I went to another Chatters, the larger supply store that we have here. Thankfully they had OPI Sparrow Me The Drama.. And I spotted CG Lighthouse before I went to the till. I never turn down a yellow! Then, last weekend here in S'toon was the 'original sidewalk sale' downtown. After my shift on Saturday, I hit the action with my sis, her bestie/my other little sister and we met up with C.. Of course I purchases nail polish.. And a couple other items.. Anyways! Like I said before.. I can never turn down a yellow. I grabbed it first and saw it was 'Pippa', I hear that polish name mentioned so much.. Funny I rarely look at Zoya swatches because I know I don't have immediate access to them. I wish I would have looked at it more. I LOVE IT~ And next to it on the counter was 'Kelly', which I also needed to have just because. I also grabbed CG Crackle in Latticed Lilac while I was there.. And then slapped it on over Pippa and Kelly. Gorgeous! 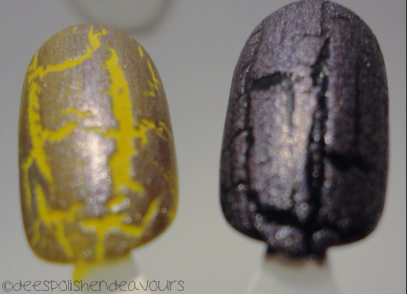 I might have to actually get some more of the metallic crackles! 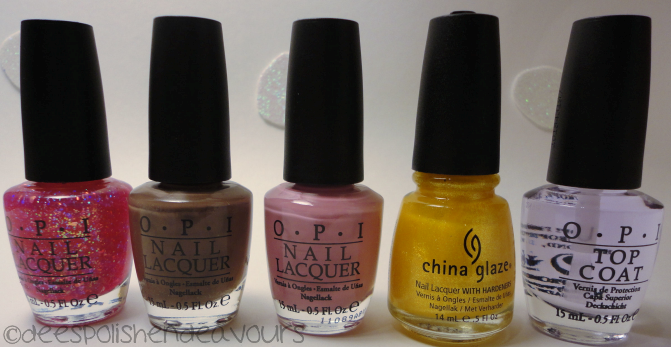 One more quick photo.. OPI I Lily Love You over some nail wheel swatches from before.. Here it is over: SH Silver Sweep, WnW Black Creme (love! ), CG Rich & Famous (love!) and CG Lemon Fizz. Phew.. Alright.. Enough of that for now.. I need to go get some sleep before work! I hope everyone is having an excellent week! I had two fabulous days off! My brother actually had today off (they were rained out.. Well, it was too damp for them to work).. So we had an impromptu day of mini golf (I won, but he won the free game!) and Ruckers action.. We picked sequins covered hats as our prizes! I work the next 6 days, but 4 of them are managing shifts, so I should have my nails painted! Despite all the images I have saved, I lack motivation lately! Any ideas? ALSO, I contacted the winner of the Apothica contest. Hopefully hear back on that soon so I can post up the winner!! Take care.. I'm off to bed!! I will answer comments next time - I promise!! 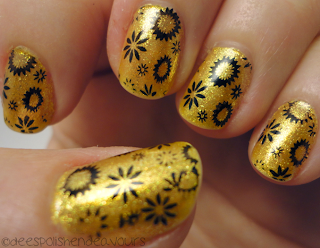 Love love love that stamper design!